I've got a new musical project, and I'd love to tell you about it. I've been calling it "io" (like, the moon of Jupiter, or the Greek goddess). 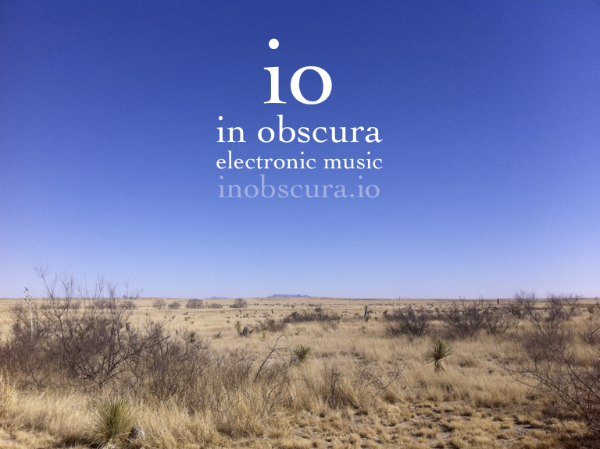 But, there are already a couple other "io"s out there, so now "io" is short for "In Obscura" (which is Latin for "in darkness", and which is also the first part of the inscription on my wedding ring: "in obscura, in luce": "in darkness, in light"). If you've followed any of my musical projects in the past (Drop Trio, Black Joe Lewis, the ARP Log, etc), the last 3 years may have seemed like a pretty dark time for me, creatively. Not so! In fact, just the opposite: I've been making more music than at any other point in my life (more than even I can keep up with). As of the start of 2013, in the 8 months I've been working on it, I've already put out 128 songs (grouped into 32 "EPs", or short albums). This comes out to just over 9 hours of original music, with all parts written, played & recorded by me. Or, you can download the complete set as a zip file (currently 750MB) with this link. I have every intention of keeping it up, and I'm even hoping to play live shows at some point in the future. If you want to keep up with what I'm doing, sign up for my email list, follow me on Twitter, friend me on Facebook, pin me on Pinterest, etc. You Rock!! Going To Download It When I Get Back Home. On My Way To Georgia To Do A Pro Tools Studio Install. It's been a long day at work, almost managed to get through all of it. Are you planning on licensing any of this stuff? A lot of it reminds me of the soundtracks to some of the immersive indie games, might be some market/collaboration options there. Chris: awesome, let me know what you think.